Ideal for a large family vacation - This Penthouse will comfortably accommodate 12. The stainless fridge is full size and is perfect for groups wishing to keep costs down by cooking at home. The kitchen comes complete with dishwasher, blender, rice cooker, toaster, microwave, coffee maker and all essential cooking utensils. Easy to keep clean with new granite counters and dark slate tiled floor. There really is a feeling of opulence as you relax both inside and out on the overly large full length lanai. Coming for Christmas? Our team can install a fully lit Christmas tree with snow skirt ready for your gifts to be placed under for an additional charge. Just ask your booking representative for details and pricing. The expansive living room area is on entry level and has a dining table that seats 6 comfortably plus a breakfast area with stools for an additional 3. The entire suite is equipped with wireless high speed internet and the HD TV's all come with cable. The condo will sleep 12 comfortably in beds. Guest Bedroom one offers two Queen beds. Guest Bedroom two also has two Queen beds. There are two bathrooms on the upper level and one bathroom with powder/ vanity area on the lower entry level. All bathrooms are equipped with all towels, soaps etc. and a hairdryer. The unit also has its own washer & dryer at no additional cost. An iron and ironing board are also within the unit. You get a free assigned parking stall with this unit, so you are able to drive around the island and see all the beauty that Oahu has to offer. Please Note: Royal Kuhio Parking garage cannot accommodate any tall vans above 6 ft 3 inches so be careful to check with your car rental service about vehicle height. 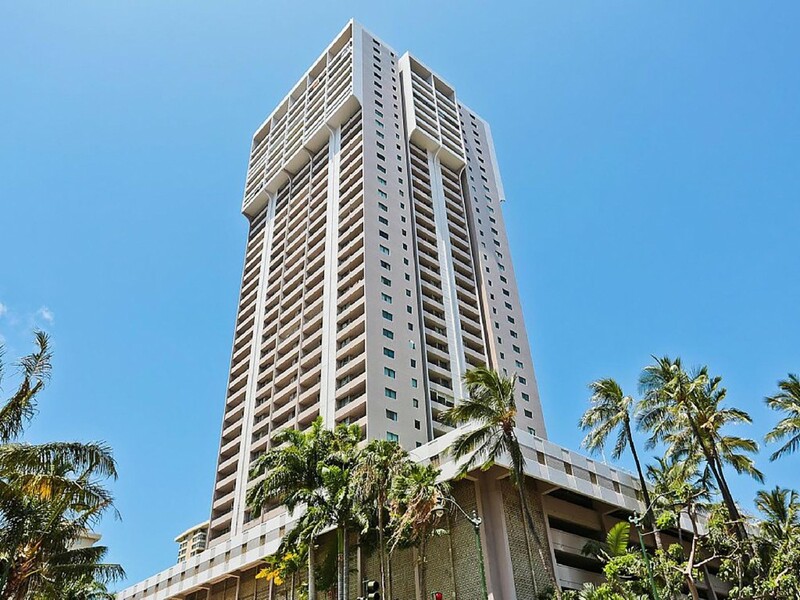 The Royal Kuhio building has a huge recreation deck with a large ‘L’ shape swimming pool with lounging area, putting green, Sauna, BBQ area, tennis courts, exercise room, playground, Gym with Bathrooms, Pool tables & Ping pong tables along with a large coin operated laundry facility. Add all that to the comfortable and spacious 38th floor Penthouse suite and you truly have a vacation home delight!